In 1925 a group of London "men about town" formed a Reserve Squadron of light bombers flying from Hendon. Nine years later the unit was re-equipped with fighters. Know as the "Weekend Warriors" the pilots trained in their spare time. As war approached, the unit was mobilized into Fighter Command, RAF, fighting with equal distinction alongside their regular comrades. 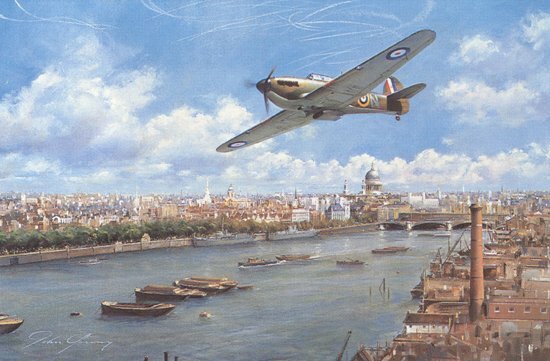 Shown flying above the River Thames is a Hawker Hurricane of No. 601 Squadron, R.Aux A.F., at the time of the Battle of Britain.